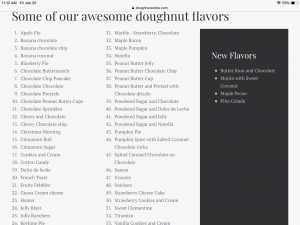 ***** Doughnut Works, 301 West Atlantic Avenue, Delray Beach, Florida 33444, (561) 808-7122. Got a real good donut joint for you guys to check-out, Doughnut Works in Delray Beach. Simple concept at work here…mini bite-size cake doughnuts topped with all kinds of stuff/ breakfast sandwiches, order-pickup at counter, handful of tables, open 7 days a week 7am-3pm. Yesterday morning, Jeff Eats and Mrs. Jeff Eats “discovered” Doughnut Works (which opened in July, 2018) and trust me- the joint’s doughnuts are absolutely delicious! Just so everybody here is on the same page, we are talking topped mini bite-size cake doughnuts, with not a yeast or for that matter a full size doughnut anywhere in sight. 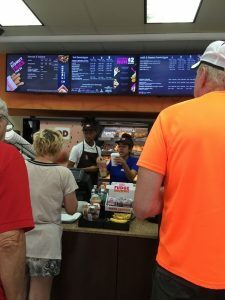 Minimum order 12 doughnuts at $8.85. 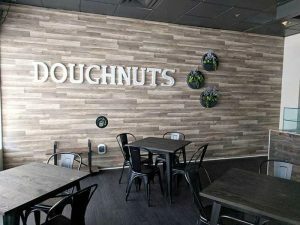 Just a quick observation, over the past 18 months or so- I’ve literally seen mini doughnut joints like Doughnut Works popping-up all over Florida. For sure it’s an interesting concept, but I’m kinda thinking that this concept maybe a FAD in the making! Just a word to the wise, Dunkin’ Donuts recently changed its name to simply Dunkin’- just maybe, doughnuts or donuts (or whatever you want to call them)- alone aren’t enough to successfully carry retail stores! Just take a look at Dunkin’s menu (dunkindonuts.com) and you’ll see what Jeff Eats is talking about! 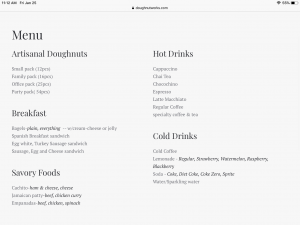 You guys can checkout Doughnut Works’ menu/prices/info at doughnutworks.com. 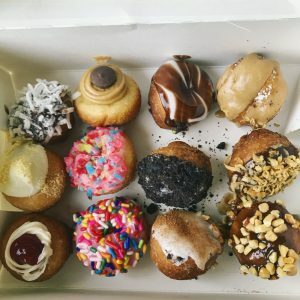 Just like the bagel store, yogurt by the ounce, cupcake, upscale burger store- this mini cake donut store concept will boom and then fizzle out. You are so right in pointing out the fact that Dunkin‘ Donuts dropped Donuts from its name and has a menu featuring all kinds of items other than donuts. Donought Works will have a brief run and if it doesn’t broaden its offerings will be gone. I agree 1000% that these donut shops are a FAD in the making. Dunkin’ didn’t drop the word Donuts from its name for no reason. Mini cake donuts taste good, but there is absolutely no way that they alone can carry a retail store. Fun concept, that is doomed. These mini cake donut shops have FAD written all over them. This particular joint better broaden out its menu and I mean real fast. My office is 2 blocks from Doughnut Works. 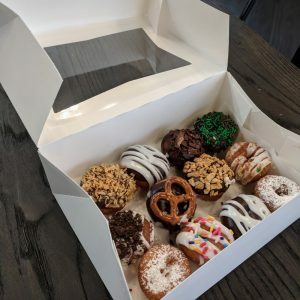 This morning after reading JeffEats my secretary picked up a package of 25 mixed mini donuts for $18 and I have to tell you everyone in my office (5 people) really enjoyed the donuts.